The function of many proteins is tuned and regulated after they are synthesized by modification of key amino acids. These modifications change the chemistry of the amino acid, creating a distinctive mark that can be used as a signal or to customize interactions with other molecules. Phosphate groups, for instance, can change a serine or tyrosine into a strongly polar group, which is widely used in signaling cascades. Methyl groups, on the other hand, mask polar lysines and arginines, blocking their ability to form hydrogen bonds. The machinery that adds methyl groups to proteins is highly complex, with many interacting parts. This is necessary to ensure that only the proper modifications are made based on the minute-to-minute needs of the cell. 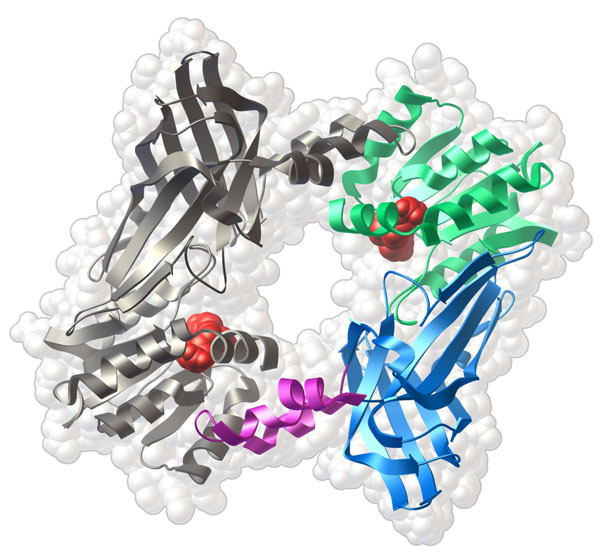 PSI researchers have recently solved the structure of one of the key complexes in this machinery, shown here from PDB entry 4g56. The complex includes four copies of the arginine methyltransferase PRMT5, shown here in blue, which performs the methyl-addition reaction. Surrounding this are four copies of MEP50, shown here in green, which acts as a scaffold for targeting PRMT5 to its proper protein substrates or attachment of other regulatory proteins. Histones are one of the central targets methylated by the class of 10 or so PRMT enzymes. Histones have long tails that extend from each nucleosome. Modification of these tails with methyl and acetyl groups is an important way of regulating the expression of the genes stored in each nucleosome. Some modifications act as activators, and others repress transcription. Researchers are currently trying to tease out the "histone code" that determines how the multitude of possible modifications control the level of transcription of each gene. Arginine methyltransferases share a common domain structure, as shown here for PRMT1, the enzyme that performs the bulk of arginine methylation in cells (PDB entry 1or8). It is composed of two identical chains, each with three domains. The domain in green binds to the cofactor S-adenosyl-L-methionine (shown in red), and is similar to other enzymes that use this cofactor. The domain shown in blue, however, is unique to the arginine methyltransferases and may be involved in recognition of the proteins that are methylated. The small loop shown in purple reaches over to the other chain to stabilize the dimer. Methylation causes a profound change in the chemical nature of arginine. Because of its many hydrogen bonding groups, arginine plays an essential role in the recognition of DNA by forming direct interactions with phosphates, sugars and bases. When these hydrogen-bonding groups are blocked with methyl groups, however, the amino acid loses this ability and becomes much more hydrophobic. This is evidenced in structures of the proteins that recognize methylated arginine, such as the WDR5 protein shown here from PDB entry 4a7j. 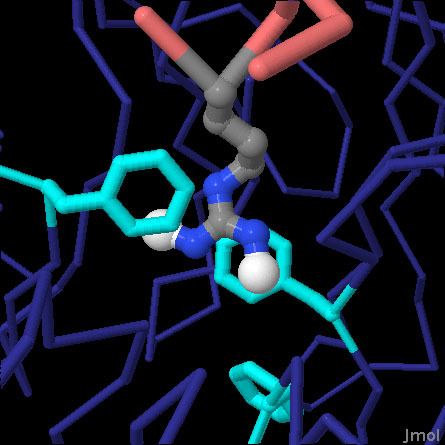 In this structure, a methylated histone arginine binds in a deep pocket surrounded by three phenylalanines, shown in turquoise. To take a closer look at this interaction, the JSmol tab below displays an interactive JSmol. This structure includes a small peptide from a histone (in pink) with a methylated arginine (methyl carbon atoms are in white). 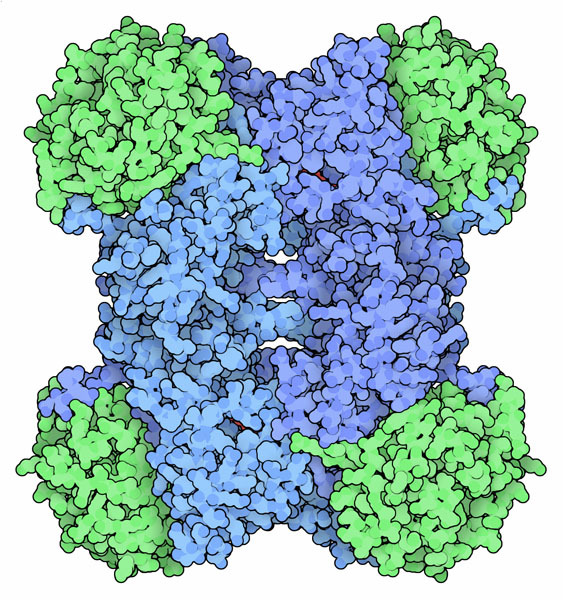 The methylated arginine binds deep inside a hydrophobic pocket in the protein WDR5, shown in blue. Use the buttons to change the representation. Bedford, M. T. & Clarke, S. G. Protein arginine methylation in mammals: who, what, and why. Mol. Cell 33, 1-13 (2009). Ho, M. C. et al. Structure of the arginine methyltransferase PRMT5-MEP50 reveals a mechanism for substrate specificity. PLOS One 8, e57008 (2013). Migliori, V. et al. Symmetric dimethylation of H3R2 is a newly identified histone mark that supports euchromatin maintenance. Nat. Struct. Mol. Biol. 19, 136-144 (2012). Zhang, X. & Cheng, X. Structure of the predominant protein arginine methyltransferase PRMT1 and analysis of its binding to substrate peptides. Struct. 11, 509-520 (2003).